Glim Glam and Pals is creating Comics and art about tiny colorful horses. After thinking for a while i came up with what i think will be a good system to offer my supporters flexibility on how they want their rewards. So now i'm introducing the Glimmer points. So now you may be wondering what are those fabled Glimmer points. Well, here is how they work. Each month, based on their donation tier each patron receives a number of Glimmer points. Those points add up from month to month and can be used on any rewards offered. There are no limits on how many rewards you can claim at once, tho bigger reward claims can take longer. At this point i'll assume you are probably wondering what kinda of fabulous rewards you can get with those said Glimmer points right? Well, lets get to it. Bellow you can see the rewards and how much they cost. Sketch [ 6 points ]: A Simple black and white (or any color your choose) sketch of anything you want. The sketch can include one character and a simple background. You can include extra characters for plus 3 points each. Lineart [12 points ]: A Simple black and white (or any color your choose) lineart of anything you want. The sketch can include one character and a simple background. You can include extra characters for plus 6 points each. Color [ 24 points ]: A Flat color drawing of anything you want. The sketch can include one character and a simple background. You can include extra characters for plus 12 points each. Shaded [ 40 points ]: A Fully shades drawing of anything you want. The drawing can include one character and a simple background. You can include extra characters for plus 20 points each. Black and white comic page [ 40 points ]: A Black and white comic page or strip of your very own. You can contact me with your script and we can set everything up. Color comic page [ 80 points ]: A Color comic page or strip of your very own. You can contact me with your script and we can set everything up. 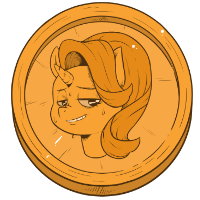 Appearance in GGaP [ 50 points ]: Would you like to see your OC in the comic? Well, now its your chance. You can tell me about your oc and i'll try to make the appearance as relevant as possible. All rewards must be claimed through the Patreon message system or on the Discord patron channel. You get 3 Glimmer points a month, access to the exclusive session on the discord channel and my personal thanks. You get 7 Glimmer points a month, access to the exclusive session on the discord channel and my personal thanks. You get 15 Glimmer points a month, access to the exclusive session on the discord channel and my personal thanks. You get 30 Glimmer points a month, access to the exclusive session on the discord channel and my personal thanks. You get 70 Glimmer points a month, access to the exclusive session on the discord channel and my personal thanks. I just want to retire on ponies. Is it too much to ask for?